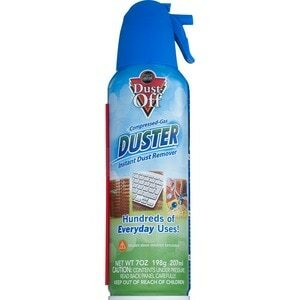 Dust and lint remover. Inhalant abuse deterrent formulation. Applications: electronics; automobiles; home workspace. Did You Know: A 7 oz can has an average of 84 2-3 second blasts under normal conditions. Because the content of the can is chemically based it will get very cold during use. This is normal. When product returns to room temperature, use it again. Keep it clean. No CFCs: Contains no CFCs which deplete the ozone layer. Steel. Please recycle when empty. Assembled in USA using both domestic and imported components. Do not shake! Usage Guidelines: 1. Remove safety tab on nozzle. 2. Do not shake! Keep can upright. 3. Clear nozzle by pointing toward open area and pulling trigger quickly 3 times. 4. Hold nozzle 3-4 inches away from object. 5. Pull trigger in series of short, 2-3 second blasts. A proper pressurized blast will be invisible when dispensed from the nozzle. A visible, white blast means the product is dispensed improperly. 6. Clean away! Important Usage Information: Never shake or tilt can before usage. Use in upright position only. Never use near a potential ignition source. Never spray into an enclosed space, such as a trash can or paper shredder. Never use on camera mirrors. Avoid skin contact with product in liquid form, may cause frostbite. Avoid contact with product in liquid form, may cause plastic to discolor. Contents under pressure. Keep out of reach of children. Use as intended, this product poses no health hazards. Intentional misuse or abuse of this product poses serious health hazards and can be fatal. Keep out of reach of children. The intentional misuse by deliberately inhaling contents may be fatal. Use in well-ventilated area. This product can be ignited under certain circumstances. Therefore, do not use near potential ignition sources, hot surfaces, or spark-producing equipment such as paper shredders or under electrical appliances. Do not tilt, shake, or turn can upside down before or during use as liquid contents may be dispensed. Liquid contents may cause frostbite on contact with skin. Contact physician if such contact occurs. Store in cool place. Do not leave in direct sunlight, enclosed vehicle, or expose to temperatures above 120 degrees F (49 degrees C), as overheating could cause can to burst. Do not pierce or burn, even after use. Contains difluoroethane. CAS No. 75-37-6. First Aid: Medical Emergencies call: 911, physician, or 1-800-498-7192. Inhalation: Immediately move to fresh air. Eyes: Immediately flush with water. Skin: Immediately wash with warm water. Treat for frostbite if necessary. Inhalant Abuse Public Safety Announcement: This product contains a bittering agent to help discourage inhalant abuse. The misuse and abuse of this product by deliberately concentrating and inhaling the chemical contents presents a serious health hazard and can result in fatality. Please use this product as it was intended and responsibly.